In order for Tanzania to achieve its economic, social and development goals such as the SDGs 2030, individuals, government and civil society need to build a more gender equitable society with healthier gender roles for women and men. To be effective, strategies must not only empower women, but also should engage men and bring about significant changes in men’s attitudes and practices which are often discouraged by negative notions of masculinity It is common among many communities for women and children to be subjected to gender-based violence and other forms of violence which include, harassment and harmful traditional practices. But there have been a number of deliberate efforts to address this problem. Largely, these efforts used women themselves as agents for change. Records show that such an approach has not borne desired fruits as GBV continues to affect many communities in Tanzania. As a result, changes have been made such that gender transformative programmes are now taking into serious account, the involvement of men and boys in ending patriarchal norms, gender inequality and GBV. There have been a lot of programmes promoting positive engagement of men in positive parenting. Evidence from researches has proved that working with men and boys to challenge toxic masculinity and gender inequality has a positive impact in improving the health and wellbeing of women and children, and men themselves. It’s in this perspective that Children’s Dignity Forum (CDF) is taking engagement of men and boys at the core of its interventions to promote gender equality, child protection and girls’ empowerment within societies. According to CDF Programme Manager, Dorothy Ernest, the organisation is taking holistic approaches to end all forms of gender-based violence through men’s inclusive programmes that build the capacity of men and boys through training, symposiums and dialogues. Gender-based violence devastates the lives of women, girls, families and communities, especially in rural Tanzania. But progress to reduce gender-based violence is possible – and reaching young people through education is key. 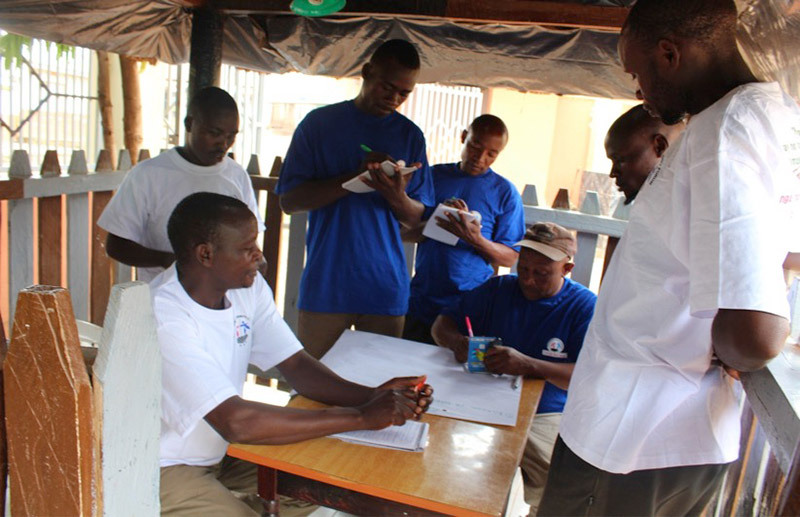 CDF engages men and boys through a community-based approach in order to challenge and change the social norms and attitudes that cause and perpetuate violence. Through engagement, men and boys have been able to take the lead in challenging harmful traditional practices such as Female Genital Mutilation/Cutting (FGM/C), child marriage, teenage pregnancy and in promoting the use of sexual and reproductive health rights (SRHR) services among women and girls, while reducing violence against women and children. CDF’s Men and Boys programme is being supported by Sida, UNFPA, Sonke Gender Justice, FORWARD and Comic Relief. The organisation’s approach in engaging men and boys to bring gender equality and promote positive parenting, has also been accepted within government at all levels, and by religious and traditional leaders. All these stakeholders do subscribe to the approach of promoting engagement of men and boys in implementation of its gender-based transformative programmes in the Mara, Dodoma and Dar es Salaam regions. In order to address the roles men of all ages can play in preventing and reducing gender-based violence, CDF examines the root causes; the socialisation of men, power and patriarchy, masculinities, gender inequality and the links to all forms of violence against women. As highlighted by CDF Executive Director Mr. Koshuma Mtengeti, ‘’As major perpetrators, the target audience for primary prevention, holders of the social norms and influencers on other men, men need to be engaged to reduce and prevent gender-based violence in their communities’’. Through its Involved Fatherhood Programmes, CDF provides training on positive and caring fatherhood which aims at building capacity in terms of skills, knowledge and attitude on the role of men as caring partners in promoting gender equality and positive behavior by children. Under this approach, men and boys are mobilised to form fathers’ groups and are trained on positive parenting models, protection of women and girls from violence, child marriage, teen pregnancy and Female Genital Mutilation. CDF recognises that equality between women and men is a fundamental principle of international law as established in the United Nations (UN) Charter. Achieving gender equality is a societal responsibility that must fully engage both men and women. 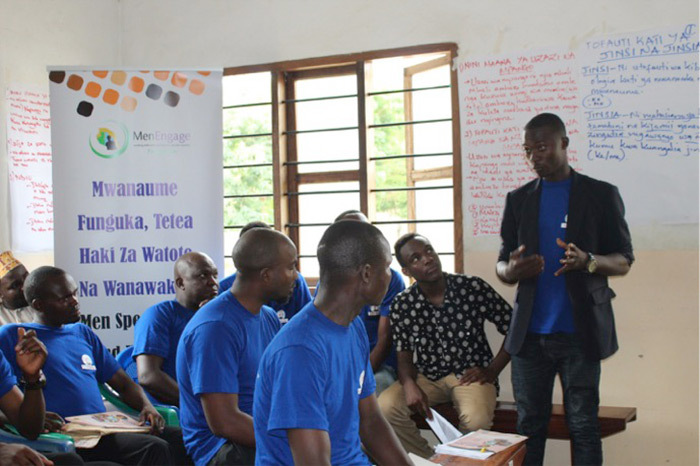 Through community-based approach, CDF has facilitated capacity building to a total of 75 men and boys aged between 20 and 75 from three districts of Ilala (Dar es Salaam), Mpwapwa (Dodoma) and Tarime (Mara) on involved fatherhood between February and March of this year, 2018. From these workshops, a total of five (5) fathers groups have been formed. Fathers groups are structures where boys and men obtain knowledge, skills and attitudes aligned with gender equality on positive and caring fatherhood. The groups are used to plan and implement advocacy activities that focus on helping community members change their attitude towards child rights, gender-based violence, involved fatherhood and positive parenting. Also, CDF conducted one men’s and boys’ (aged 18-26 years) symposium in January 2018 and two men’s and boys’ (aged 18-70 years) dialogues in Kitunda ward, Ilala District, Dar es Salaam, in August 2017. For many years, women around Tanzania have led efforts to prevent and end violence, and today more and more men are adding their support to the women’s movement. Through CDF’s intervention it has been revealed that men have a crucial role to play as fathers, friends, decision makers, and community and opinion leaders, in speaking out against violence against women and ensuring that priority attention is given to the issue. Importantly, men can provide positive role models for young men and boys, based on healthy models of masculinity. 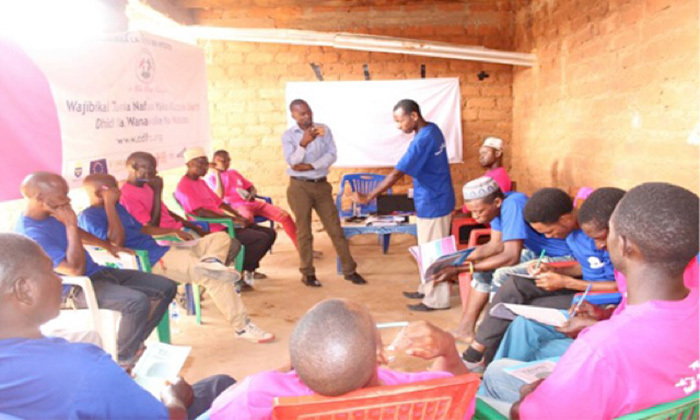 In the effort to include men as part of the solution to ending violence against women, CDF encourages active involvement of men and boys in eliminating gender stereotypes, designs and implements programmes to enable men to adopt safe and responsible sexual and reproductive behaviour, as well as supports men and boys to take an active part in the prevention and elimination of gender-based violence. CDF builds the capacity of men and boys in terms of skills, knowledge and attitude on gender equality, child protection, positive parenting and on the use and acquisition of (sexual and reproductive health services (SRHS) by girls and women in CDF targeted areas. 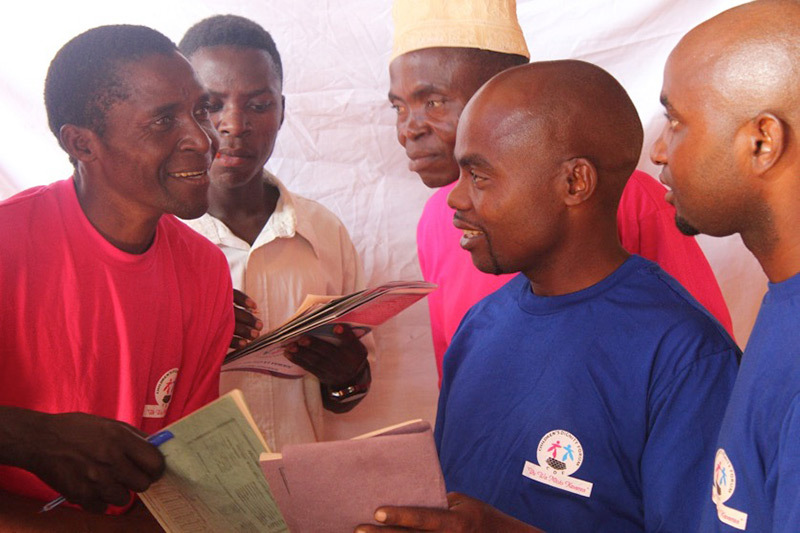 Men and boys are identified, mobilised into fathers groups and trained on various topics that can help them raise their awareness on gender equality advocacy. Seleman Kuwa from Dar es Salaam giving his views during the Session. CDF trains men and boys on child rights, including child rights mechanisms/instruments aimed at ensuring the protection of children. The approach has helped men and boys to understand children’s entitlements and are, therefore, ready to promote them. Through this intervention, hard beliefs have been changed. Said Victor, a participant in one of the trainings provided in Dodoma, has changed his perception towards children’s involvement in decision making at family level. “Personally I agree that children have the ability and right to be involved in making decisions on issues which affect their lives. So, when you ignore his/her opinion and just force the child to go to a school you like, you deny him an opportunity to go in a school he believes in. As a result, the child may even not like the school you are forcing him or her to attend, make him or her bored and perform badly. So, children need to be involved, notably on issues which involve them,” he says. 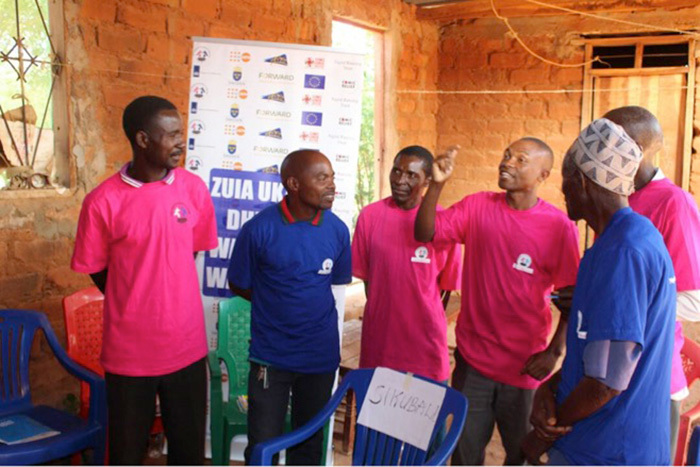 Men and Boys discussion during a training session in Mpwapwa District. In Tanzania, like in many societies, communities have been made to believe that there are household chores that are specific for women and those that are specific for men. CDF realises that this is a problem that must be addressed in order to have a gender balanced society. Men and boys are introduced to gender roles so that they can change their existing perception towards daily chores performed at home. The initiative has helped men and boys to gain understanding that there are no tasks that are for women or men in the family. It is encouraging to note that men and boys are increasingly becoming aware that every member of the society or families is required to participate in all household activities such as doing the dishes, fetching water and cooking. Beneficiaries such as Ikwambe Tumaye believe that the change must start with parents educating their children; “This bald head has carried buckets of water for many years. I love my wife. I paid 12 cows as bride price to marry her. I help her to fetch water, cook, wash clothes and bathe children. I learnt these activities while I was a child and now I help my wife. We teach our children to do the same. In my family, there is no specific duty for girls or boys. My wife is happy because she has an assistant,” suggests Ikwambe Tamaye from Mara. Men and boys discussing during a group session. “As a child, I had to graze our cattle. One day I took them to the river to drink. While at the river, our herd of our cattle met with another herd from another village. Our bull started fighting with another bull from another herd. Our bull was injured in the fight and when I went back home, my father beat me and chased me away. I ran about six kilometers to my great grandfather. “It was around midnight. I arrived at my great grandfather and knocked on the door but there was no response. So, I decided to sleep in a brick furnace. It was very dangerous; my life was at risk. I was scared that the furnace could burn and gets myself almost I could get killed there,” he remembers. Tanzania suffers adverse sexual and reproductive health (SRH) indicators including high levels of maternal mortality, adolescent births, mother to child transmission of HIV, intimate partner violence, persistence of child and teenage marriages, girls forced to drop out of school due to pregnancy, and low contraceptive use. The prevalence of these problems proposes activities that are to be undertaken by stakeholders in Tanzania while bearing in mind gender barriers, gaps and challenges that increase the vulnerability of women, men, girls and boys to accessing SRH services. For this reason CDF builds the capacity of men and boys so that they can be in a position of making informed decisions about accessing SRHR services , including access to family planning. Men and boys have changed their attitude and they understand the importance of family planning to the welfare of their families as Mr. Kizungu narrates: “Life is very difficult now. Having many children is very challenging as you need to provide them with proper care and education. If you have many children, obviously you will find it hard to provide for them. So, it is important to plan on the number of children you are going to have. Use of contraceptives or other family planning methods is something that we should understand. This will also help us to clear the misconceptions on family planning among community members,” said Kizungu from Dodoma. “Three advantages of prenatal visits are: It helps you (father, mother and unborn child) to know your health. It informs you about your unborn child’s development. And it helps you to know and understand the needs of the mothers’ health and how to give her the appropriate care,” said Mwita Stanislaus from Mara. One of the beneficiaries giving his views during a training session. Children’s behaviour is partly shaped by the type of upbringing obtained at home, regardless of it being good or bad and the same is transferred to the next generation. It is important, therefore, for men and boys to know if the upbringing they received was good or bad and if they should pass it to the next generation. To achieve this, CDF uses a participatory approach that requires men and boys to mention at least one bad trait they think is not good to pass to their children. Also, men and boys are asked at least one good trait that they think they can pass it to their children. Men and boys discussing on the needs and concerns as a father during a training session. This exercise helps them to reflect on their past experiences and evaluate them to see if they are good or bad. Through this, men and boys obtain peace of mind and realise how a parent should raise their children. ‘As a father you should be non-violent. Being non-violent includes the ability to listen to, and to put into consideration other family members’ opinions. Also a father should be non-violent, especially to his daughters, so as they may feel free to express their needs to him,” says Sospeter Mugini from Dar es Salaam. CDF recognises the power of freedom of speech and, therefore, utilises it to deliver its messages on GBV, FGM, SRHR services, child marriages and teen pregnancy through dialogues and symposiums. Two dialogues and one symposium have been conducted in Kitunda, Dar es Salaam. The first dialogue was conducted in August 2017 through which 30 men and boys have been reached, while the second dialogue was conducted in April, 2018 through which 45 men and boys have been reached and the symposium was conducted in January, 2018 through which 30 men and boys have been reached. “Early marriage is caused by girls being too ambitious. They want to own things they cannot afford. This in turn causes them to engage in sexual relationships at an early age”. Men and boys discuss the importance of men’s participation in parenting. Varied views are normally given, including patriarchal norms, lack of awareness and the breadwinning role of men. As Michael Kishina says, “The majority of men believe that men are only the breadwinners, while the parenting responsibility is only for women”. Also, men and boys understand that social norms have a big contribution in preventing men from active involvement in parental care. Talking about this, Twaha Shaibu has the view that, “The patriarchal system has made men to hold the primary power and dominate all decisions of family matters, while women are responsible for parenting children”. On another hand, Mr. Mugini, an influential man, has the view that caretaking is a responsibility of both parents, “Both parents must engage on parenting but the difference is that the woman has more time to deal with the upbringing of the children, while the man spends much of his time looking to earn a family income. That is why men are viewed as inactive in parenting. If we intend to bring change on that, awareness should be created amongst men. As a result, they will be able to take care of their children – to take them to hospital or the clinic and the like. But the bad thing is that women themselves become surprised when they see a man taking a child to the clinic. This is discouraging us”. Another discussion area is on FGM and who among the two parents authorises the child to be cut. Discussion on this area helps men to gain understanding on who among the two parents (father and mother) is responsible for authorising FGM practices and what can be done to end it. Hamza Juma (WEO – Kitunda), has the opinion that the father is the one who authorises the FGM practice. Commenting on this he said: “Men have a final say when it comes to FGM, mothers tend to respond without challenging it. Thus, fathers have a great power to influence the practice of FGM”. Ahmed Said, “Fathers are the ones with a power to influence the practice of FGM because they are always tending to be unchallenged”. On the other hand, Sheikh Salum has a different opinion. He believes that the mother is responsible. “With reference to knowledge we acquired throughout of the training sessions, bad traditions and customs are perpetuated by women because they are the ones who stay longer with their children compared to man”, said Sheikh Mohamed Salum. Men and boys are calling upon the community (especially men as the practice is done to please them sexually) to stop the practice. Men are the ones who want women to be cut so that they can be married. According to Mwita Ryoba, “people need to understand that youths can be educated and understand the effects of FGM, however, the problem still remains with parents because they are the ones who do not want their sons to marry a woman who has not undergone FGM. In Kurya customs and traditions, marrying a circumcised woman makes a man acquire respect. To change this we need to work with traditional elders to disseminate the knowledge on the effects of FGM to the community as they have a great influence. All we know is that at the core, FGM is to prepare girls for marriage, thus men themselves have to be in the frontline in fighting such an evil act”. CDF is at the leading edge of connecting the understanding of men and masculinities with prevention work, and expanding the positive roles men can play to recruit new allies, new approaches, and new paradigms to strengthen efforts to end violence against women. This has helped men and boys to be active in the community by fighting GBV. “Following the training we started working first in changing relations in our own families. Some of us have started having weekly meetings with our families to create an opportunity for family members to speak their opinions. We have also started to strengthen relations with our children and our partners by being so close to them spending time to listen and also to find the most amicable ways to address challenges, misunderstandings and disagreements within our families” Said Rev Godwin Chilomo, chairperson of CDF Fathers’ Group in Berege Ward, Mpwapwa. He continued: “We have a number of activities and experiences from the community since the training and I can share two examples of the work we have done. The first is the case of a Form Three girl who dropped out of school because of pregnancy. The case was covered up by families and community members, but once we discovered it we decided that we will not remain silent. So, we decided to collect more information about the incident and we were informed of a man who is the culprit and we communicated with Police Gender Desk at Mpwapwa Police Station and the man was taken into custody . There was also another case from a sub-village called Makweme where there was a father who was beating up his child everyday, sometimes for no apparent reason. After we were informed, we asked our members in Makweme sub-village to go and meet with the father and talk to him politely and teach him on how to care for a child and how physical abuse will end up harming the child. We are glad that the father was receptive and he had listened to us and he promised not to use force against the child, but spent time directing and instructing his child. Our fellow there is doing regular visits to the family to also assist them on how to help the child in a very positive and constructive way that will not do any harm to the child. Finally, there was a case which was attended to by our Fathers Group secretary in late March. It was about a father who has two children one aged 5 (a girl) and the other aged 7 – a boy. Both these children were supposed to be in school, but they were not enrolled and the father had sworn that he will not take them to school as it is of no importance. Our secretary talked to the elders within our group and other adults in the community and they went to meet with the father and asked him to think twice about his stand, appealing to him that education is the children’s basic right and is key to their future lives. The father has since agreed that he will find all means possible to send his children to school and we are trying to find the ways to discuss this with respective education authorities the possibility of the children starting school this year.